One of the most compelling reasons for avoiding packaged foods is their high sodium content. That little foil “flavor” packet that gets added to rice and water contains a whopping 640mg of sodium per serving – about 27% of the Recommended Dietary Allowance (RDA). I don’t know about you, but I like all of my food properly seasoned, and leaving 73% for the balance of my food intake is just bloody ridiculous. Never mind the fact that it really doesn’t taste very good. 😉 So next time you’re tempted to buy that box of Rice-A-Roni, just keep walkin’… Head to the produce department for a lush green bunch of cilantro and a shallot or red onion. You will need long grain white rice (I like basmati), ground cumin, and a couple of other simple ingredients from your pantry. This recipe is the 4th (and last for now) in a series of healthy Mexican recipes. I started out with our favorite Roasted Tomatillo and Hatch Green Chile Salsa – perfect with tortilla chips or tacos and truly elegant with my Mexican Spiced Pork Chops With Salsa Verde and Cotija. The pork chops were accompanied by Chipotle Honey Lime Glazed Roasted Delicata Squash and this Mexican Cilantro Rice. These 3 dishes will certainly make a simply elegant dinner menu. I have been making some version of this rice for over 30 years… yes, I’m that old! Given that I am now a food blogger, I decided it’s high time I aim for consistency. I love cilantro, and due to its moisture content, it impacts the end result. I think we all prefer fluffy rice? 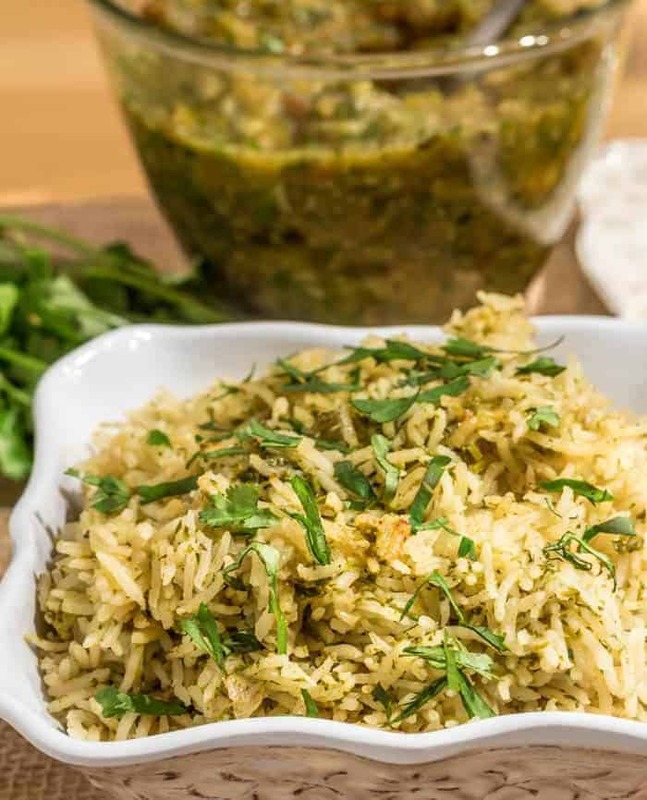 This method provides a fluffy flavorful batch of rice with just 1 quick additional step. Place the cilantro in a small food processor or blender, and add about 1/2 cup of broth, stock, or water. Purée until cilantro is essentially liquefied. Using a spatula, scoop the mixture into a 2 cup glass measuring pitcher. Add enough broth, stock, or water to bring the level to exactly 2 cups. The rest of the recipe instructions are pretty standard. The onion or shallot,garlic, cumin, and rice get sautéed in a bit of coconut or olive oil until fragrant. Add the prepared cilantro mixture and salt. Bring just up to a boil, lower the heat, and simmer 19-20 minutes. Fluff with a fork, and you’re good to go! 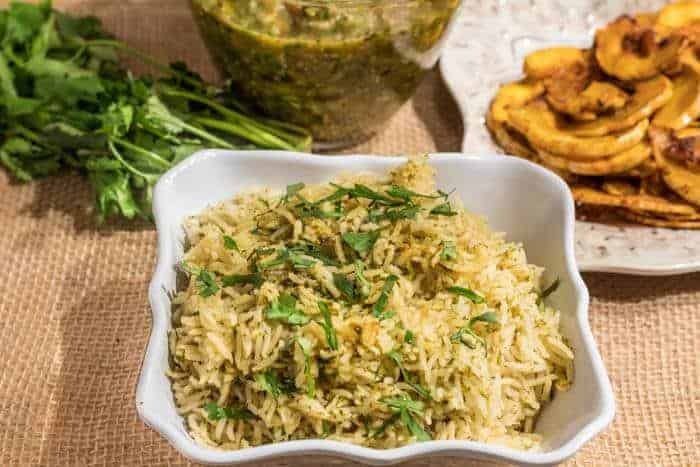 A simple, flavorful Mexican cilantro rice to pair with your favorite Mexican mains! Cut the cilantro at the base of the leaves. Add them to the bowl of a small food processor or blender. Add 1/2 cup of liquid. Pulse until you have a very green liquid (very finely chopped cilantro). Using a spatula (you don't want to miss any! ), add to a 2 cup glass measuring pitcher. Add liquid to exactly 2 cups. Set aside. To a smallish saucepan, add a drizzle of coconut or olive oil. Bring to medium-high heat. Add the shallot or onion, garlic, cumin, and rice. Saute until fragrant and shallot is softened. Don't brown it. Pour the cilantro mixture into the saucepan. Bring to a boil, then immediately reduce the heat to simmer. Cover. Simmer 19 minutes. Remove from heat, and allow it to rest 5 minutes not lifting the lid. Fluff with a fork, and garnish with additional chopped cilantro if desired. The size of a bunch of cilantro varies. I want at least a cup tightly packed. I prefer broth or stock to water, but the choice is yours. I'm so glad you guys enjoyed it! I'm only slightly jealous that you're in the mountains enjoying a meal together ;-) Texas is kind of flat! The feedback on cooking at that altitude may be useful to another reader, so thanks for taking the time to write in!